Congratulations to Jake Patridge on committing to University of The Sciences!! Jake had a strong summer of 2016 on the mound for Team All American. He threw a number of offspeed pitches that kept hitters constantly guessing en route to one of the best ERAs on the team. Great to see all of your hard work pay off! Congratulations to Jake and the Patridge family! Go Devils! Congratulations to RHP/RF Tommy Jacob on choosing Misericordia University!!! Tommy joins a Cougars team that finished 52nd in the nation in 2016 with an opportunity to make a 2-way impact. Tommy turned in a dominant and downright impressive fall 2016 season for All American, leading the team in Wins, Strike Outs and ERA on the mound. He was equally impressive at the plate leading the team in batting average and extra base hits, and in right field making diving catches and throwing out runners. It was great to see Tommy grow over the course of a couple years at the academy. The velocity program took him from upper 70's to high 80's and made a tremendous impact on his power at the plate. Tommy has a bright future ahead of him at Misericordia and we can't wait to see him shine at the college level! Congrats to Tommy and the Jacob Family!!! Congratulations to Nick Crane, 2016 C/OF on his choice to continue his education and career at Valley Forge Military College!!! Nick Crane is a leader. He played 2 years for Team All American and improved his game dramatically over that time. He plays the game the right way. Always hustling, always involved. Leaves everything on the field. He was excellent defensively handling pitchers and caught double digits in would be base stealers in the summer of 2015 for Team All American 17U. He also possesses great instincts on the bases and has plus speed for the catching position. Nick had a handful of colleges interested in him, but he based his decision on his desire to serve our country in the Military after college. We are very proud of all that you have achieved during your time with us and we know you'll excel at VFMC! Congrats to Nick and the Crane Family!!! Congratulations to another 2015 Team All American Member, Ryan Logan, 2016 LHP/OF on his commitment to United States Merchant Marine Academy!! Ryan Logan is a tremendous athlete with a tremendous work ethic. He's receptive, he's coachable, he excels in the classroom, and when it comes to college, he's going to his #1 choice. While he had offers from Division 1 and 2 programs, his desire to study marine biology came first. Ryan impressed us with his great attitude and leadership skills this past summer. He threw low to mid-80s off the mound as a junior and led Team All American in K's for the 2015 summer season. He also did his part with the bat, finishing second on the team in doubles, hitting the fence on numerous occasions. We are sure he will continue to excel in all areas, on the field and off the field at USMMA! Congrats to Ryan and the Logan Family!! Congratulations to 2016 grad, Sean Kelly, 1B/C on his verbal commitment to Division 1, Mt. St. Mary's University! A great summer with Team All American really paid off for Sean when The Mount took notice of his skills at our JMU tournament. Sean had a typical day lacing multiple doubles and playing stellar defense at first base. He went on to be named our Summer Elite Teams Player of the Year for 2015- .522 batting average (24/46), 11 doubles, 1 triple and 11 RBI's. Congrats to Sean and the Kelly family! We expect him to have a great career at The Mount! Congratulations to Aaron Wolf on choosing Division 2 California University of PA to continue his academic and athletic career! Aaron was by far our most dominant pitcher for Team All American last season striking out 32 batters in 31 innings of work during the summer while picking up 4 wins. He continued to work hard all offseason and saw his velocity jump from upper 70's to mid 80's by the time our Louisville Slugger Top Prospect Showcase rolled around and went on to participate in the Velocity Plus Arm Care Program in the last couple of months leading up to school ball. Cal U PA is getting a very hard working, poised and coachable young man for their pitching staff in 2015. We're very proud of your accomplishments and we know you'll have a bright future for the Vulcans! Congrats to Aaron and the Wolf Family!!! Congratulations to Eric Dyke, RHP/OF 2015 on choosing Franklin & Marshall College to continue his education and playing career! Eric had numerous options, and months of tough decision making, but he finally chose F&M to pursue a degree in engineering. The Diplomats are getting a great student athlete and a great young man in Eric. Congrats to the Dyke Family and we wish you the best of luck in the future!! Congratulations to Austin Stansbury on choosing Franklin Pierce University to continue his education and playing career at the Division II level! An awesome achievement for a fine young man who always shows up ready to work hard and face any challenge the game may bring on any given day. Congratulations to Austin and the entire Stansbury Family! Best of luck!! 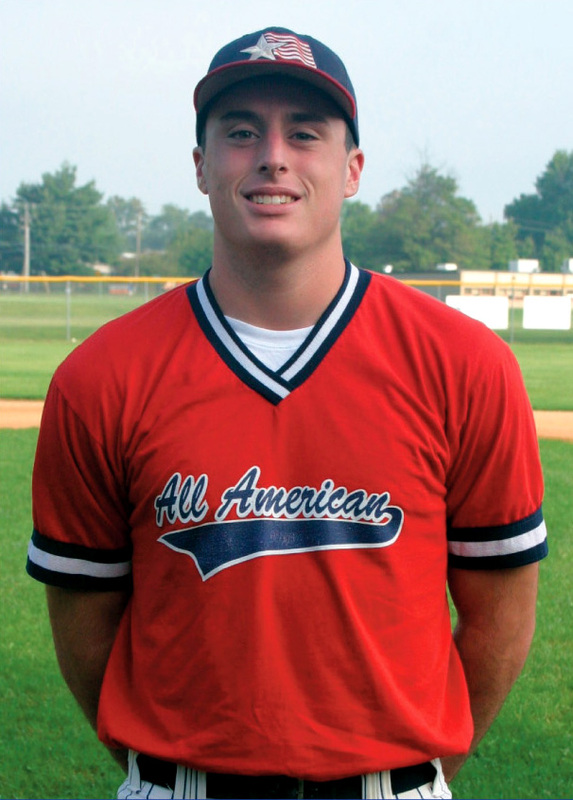 Congratulations to Austin Anderson, 2015 MIF from Emmaus HS on choosing Penn State Altoona! Austin will major in Electro Mechanical Engineering while continuing his playing career with the Nittany Lions. Awesome achievement, congratulations to Austin and the Anderson family! Best of luck!!! Congratulations to Grant Wallace, RHP 2015 on making his decision to play college baseball at Neumann University! Grant worked very hard over the course of the past 6 months to get his pitching to the next level and numerous college coaches took notice. In the end, Grant chose Neumann for it's proximity to family and the opportunity to contribute early on for a Knights team that is coming off of back to back 30-plus win seasons in 2012 and 2013, 3 consecutive playoff appearances, as well as a Top-25 DIII national ranking in 2012. Great job Grant, best of luck at Neumann and congratulations to the Wallace Family! Go Knights! 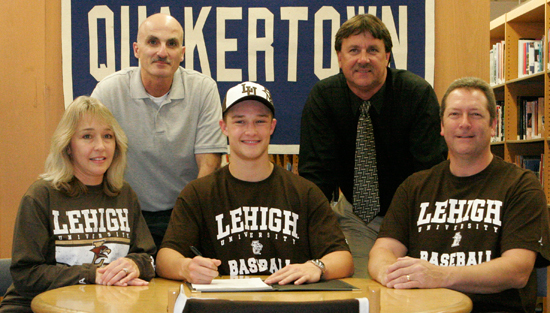 Congratulations to 2015 C/3B Ben Burman on choosing Susquehanna University! The senior had many choices, but after taking a visit to the campus and watching the Crusaders in action at practice, he knew SU was the right fit for him. Congratulations to Ben and the entire Burman family! Best of luck in the future! Congratulations to 2014 C/1B Seth Brosius on making the team at York College!! Seth brings athleticism (he was a 3 sport player in high school- football, baseball and wrestling), leadership, line-drive ability, great receiving skills and a mid-80's arm from behind the dish to the Spartans in 2015. We're very proud of all the hard work that has led you to this point Seth! Best of luck in 2015! Congratulations to Jared Bass, 2014 1B/RHP on choosing Capital University (OH) to continue his education and playing career! Jared has been with us since 2012 and has worked very hard over the years to improve his strength and skill all around. The Crusaders are getting a very passionate and dedicated young man for their program in the fall of 2014. Congratulations to Jared and the entire Bass Family on this great accomplishment! 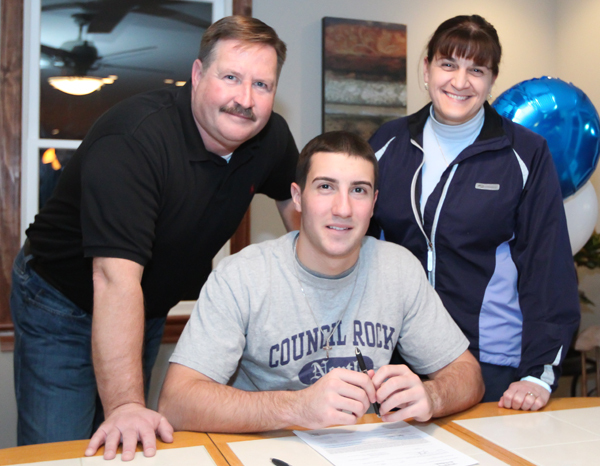 Congratulations to Richie Marinelli, 2014 on choosing Messiah College!!! Richie looks to take his 6.8 speed and gritty play to centerfield for the Falcons in 2015! Congratulations to Spencer Tinkel, 2015 on his verbal commitment to The College of The Holy Cross (#198, Division I)!! I've had the distinct privilege of working with and coaching this fine young man since the time he was 14 years old. Beyond his athletic talents are the intangibles that every coach looks for in a player. He was always receptive to instruction and incorporated everything he was shown over the years. He always maintained a great attitude no matter what happened on the field. No excuses. He's a leader and a role model for younger players. He's always been focused, always worked hard and that type of approach helped gain him recognition right away in our organization. In his first season with All American, he was named AABA's Fall Elite Teams Player of the Year for 2011 after winning 3 games in a month for the 14U Stars while batting .500, leading the team in hits with 13 (5 doubles) and runs scored with 7. 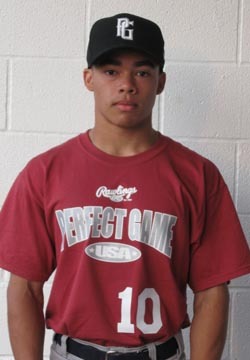 By his freshman year he was playing for our 18U Showcase Team and continued to perform, earning AABA Player of The Month honors for August of 2012, batting .400 on the month. By the time he was a sophomore at New Hope Solebury High School he was a 2-way varsity starter for the Lions and earned AABA's High School Player of the Year recognition after batting .500 with 30 RBI's and 22 runs scored in 19 games. His 7 Doubles, 4 Triples and HR, 3 wins on the mound and 40 strikeouts in 35 IP helped the Lions reach the playoffs in 2013. His strong play continued through the summer and fall for our 17U National Showcase team batting .300 for the year with 23 strikeouts in 25 innings pitched. His exceptional work ethic has helped his fastball climb into the mid-80s and helped him run a 6.8 60-yd dash. The sky is the limit for this young man- this is only the beginning. I’ve truly enjoyed working with him and I know the coaches at Holy Cross will feel the same way. Congratulations to Spencer and the entire Tinkel Family!! Congratulations to Harrison Guber on choosing Ursinus College! Congratulations to Matt Oruch on choosing Division 2, Gannon University! Matt has been a lock both in centerfield and in the leadoff spot for our 18U Showcase team the past 2 years. His performance was downright impressive both defensively and offensively, earning him AABA Player of the Month honors twice. It seemed like every ball hit his way ended up in his glove no matter how well struck it was and runners who challenged his arm paid the price on a frequent basis. He was certainly one of the best outfield prospects we've had in 15 years. Offensively he always found his way on base. In 2013, he went 66 at bats without striking out, en route to a .405 average for the year. In his AABA career he compiled a 68/191 (.356) batting average, .417 On Base Percentage, 29 runs, 21 RBIs, 4 doubles, 2 triples and a team best 17 stolen bases through 2012-13. The only thing more impressive than his playing ability may be his exceptional attitude and work ethic. During the fall of 2013 Matt played through a torn hip muscle for most of the season because he knew the team needed him and he knew how important the playing experience was for him. He attended every practice he could over the course of two years and always worked hard/made adjustments whenever he was asked. He wanted to be the best player he possibly could be and he worked hard to achieve his dream. It was a privilege to coach such a fine young man and I'm sure he will excel at Gannon over the next 4 years. Congratulations to Matt and the entire Oruch Family!!! Congratulations to Adam Arcadia, LaSalle College HS 2014 on choosing #46 Belmont Abbey College!!! Congratulations to Ian Shaffer, Wilson HS 2014 on choosing Widener University!!!! Congratulations to Jake Goldberg, Pennsbury HS 2014 on choosing Philadelphia University!!! Congratulations to Evan Myers, 2014 Pope John Paul II HS on choosing Seton Hill University!!! 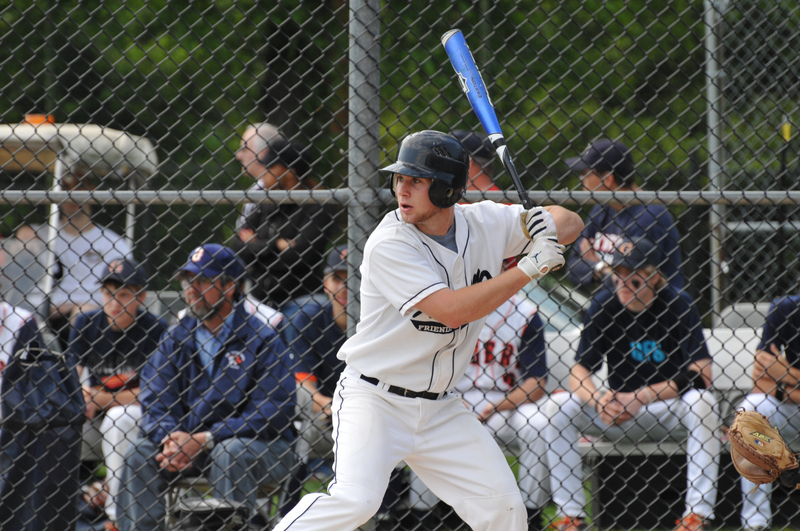 Congratulations to Jake Vesling, 2014, New Hope Solebury HS on choosing Union College, NY!!! Jake played the past two years with our 18U AABA Stars, posting a 52/144, .361 batting average with 23 RBIs, 35 Runs, 9 Steals 4 Doubles, a Triple and a HR. On the mound he pitched 45 innings, posted a 2.80 ERA, 39 K's, 2 Complete Games, 4 Wins,a Save. I must say I've had the distinct pleasure of working with Jake from the time he was 14 years old. He's an extremely coachable, intelligent, conscientious young man. He was one of our most heavily recruited prospects throughout the 2013 season, and for good reason! He was tremendous all year on the mound, at the plate and in the field. Jake's progress in the field at shortstop over the course of a year was remarkable. He took extra time out of his schedule to work with me on taking his glove to the next level. Jake's 2013 saw diving plays and throws on the run to nab runners on a consistent basis, catching the attention of coaches in every venue we attended. Jake is also a stud in the classroom and will receive a large academic scholarship to attend Union College. He says the ability to be a two way player at SS and in the pitching rotation as a freshman for a Top-90 Nationally Ranked DIII program was a major factor in his decision. Jake plans on pursuing a degree in Engineering. We at the Academy have no doubt that Jake will be a big part of the Bulldog's success over the next 4 years and we wish him the Best of luck!!! Congratulations to Jake, and the Vesling Family on a great accomplishment!!! After fielding offers from various schools, Tim Brennan, RHP, 2015 has verbally committed to St. Joe's University!!! Tim said that after speaking with the coaches, assessing the academics, attending team practices, and finally, evaluating a nice scholarship offer that the Hawks were the right fit for him. Tim takes his 83-85 MPH Fastball and a bevy of other moving pitches that induce groundballs to a St. Joe's program that has been on the rise for the past few seasons (The Hawks finished 26-26 in 2013). Tim is only a junior in 2014, but he's coming off of an impressive year with Holy Ghost Prep High School in which he went 6-0, winning the League Title game and the District 1 title game for the Firebirds. He also saved 8 games en route to a 0.55 ERA. A dominant month of May earned Tim AABA Player of the Month honors (3 wins, 2 Saves) and he continued to dominate all summer with the 18U Stars. Playing showcase baseball for the first time, the sophomore struck out 11, only surrendered 7 hits and 1 ER in 16 IP, for a team best 0.56 ERA. Tim's standout ability on the mound is his efficiency and ability to throw all of his pitches for strikes at any time. He keeps hitters off balance, consistently controls the count and induces bad contact. Over the next 2 years, Tim has time to fill in his 6'2, 170 lb athletic frame and add more velocity to an already impressive fastball. Tim is a hard working young man and we at the Academy are extremely proud of his accomplishments. We're sure there are many great things to come in Tim's high school and Division 1 career at St. Josephs University! Congratulations to Tim and his family!! Congratulations to Mark Dougherty on choosing Ursinus College! Mark's story is certainly a great one. He came in to try out for our 18U team in late August of 2012, a 6'5 left handed pitcher who was never shown how to use his body correctly. The velocity was missing as well as the control and other organizations had no idea how to help him. You have to give Mark credit, the one thing that wasn't missing was a great receptive attitude. He never gave up on himself. He listened to whatever he was told to try by our coaches and put in extra work on a daily basis in order to transform himself in time for an opportunity to play college baseball. After 5 months of hard work and dedication Mark added 10 mph to his fastball, was able to throw strikes consistently and had offers from multiple schools. This achievement is a testament to the importance of quality instruction coupled with the right attitude and work ethic in a player. We're all very proud of you Mark and wish you the best at Ursinus! Congratulations to Rafael Fernandez on choosing Chestnut Hill College! Years of hard work and training have paid off! Best of luck in your 2013 Cheltenham season and your college career with the Griffins! Congratulations to Brett McCutcheon 2013 on choosing Widener University! Brett joins fellow mid-80's throwing teammate Joe Richie as the two look to bolster the Pride pitching staff in the fall. Brett enters the 2013 season at LaSalle College High School looking for another State Title run and we'd like to wish him the best of luck! Congratulations to the McCutcheon family! Congratulations to Andrew Schuler on choosing DeSales University! After fielding multiple offers the 2013 Perkiomen Valley HS grad has made his decision. Andrew devoted the final months of 2012 to finding whatever MPH he could for his fastball and the hard work paid off as he threw 89 MPH off the mound for scouts at our Louisville Slugger Top Prospect Showcase in December. Andrew has always been a gamer for AABA, sporting a variety of pitches that he can throw for strikes. In the summer of 2012 he had two complete game double digit strike out performances for the 18U Stars. We're sure more dominant performances will follow at DeSales. Andrew will be joining Academy Alumni, and now Bulldogs, Rob Hoffman and Jake Yannessa in the Fall of 2013. Congratulations to Andrew and the Carr family and we wish Andrew the best of luck in the future!! For years there has been a distinct sound whenever Caroline and Julia Schoenewald were at All American Baseball Academy. A series of loud cracking metal followed by loud smacking of neon green softballs against the upstairs tarp. Impossible not to notice. In fact, quite often they'd embarass any boys hitting in the building. These sounds were often followed by praise from their hitting coach Bob Vivian. It was inevitable that these girls would be recognized by numerous college recruiters. We're proud to announce that they've made their decisions to attend two fine academic institutions. Julia Schoenewald will be taking her talents to Brown University, a tremendous Ivy League school that's a perfect fit for the Class President who ranks #15 in her class academically. Her off the charts SAT scores and experience as a 2 year captain for the CB East Lady Patriots helped convince Brown that she'd be perfect for their program as well. Julia is sure to make a huge impact right away for the Bears! Caroline Schoenewald is headed to face ACC competition with the Virginia Tech Hokies. The Hokies are ranked #30 in the nation after going 42-21 in 2012, but something tells us Caroline is up for the challenge! In her freshman year at CB East, Caroline hit 4 home runs in a week... she's a sophomore this year! With 3 more years to develop her skills she's sure to be an impact player as a freshman for the Hokies! We're incredibly proud of the hard work and dedication these two fine young ladies have exhibited over the years and all that they've achieved thus far. We're sure they will continue to impress at the collegiate level, both on and off the field. Congratulations to the Schoenewald Family! Joe Richie will be attending Widener University in the fall! After considering numerous options, Joe found a school that fit his needs academically as well as athletically (The Pride finished the 2012 season with 20 wins). A pitcher with an arsenal like Joe's should contribute to bumping that win total up right away in 2014! What is Widener getting in Joe Richie? All the intangibles that every coach looks for in an athlete. Dedication. Work Ethic. A Positive/Receptive Attitude. A Competitive Spirit. An Unending Desire To Push Himself Further. The list goes on and on. 2012 was a great year for Joe as he posted a line of 44 K's in 36 IP at Exeter High School, picking up 3 wins and a save for his 9-11 Eagles. Joe went on to strike out 22 more in 25.1 IP during the summer, en route to posting a 2.87 ERA for the 18U Stars and added 16 more K's in 15 innings in the Fall (82 K's in 76.1 IP Overall). This offseason, Joe has been working extremely hard, breaking nearly every Academy strength and speed record! 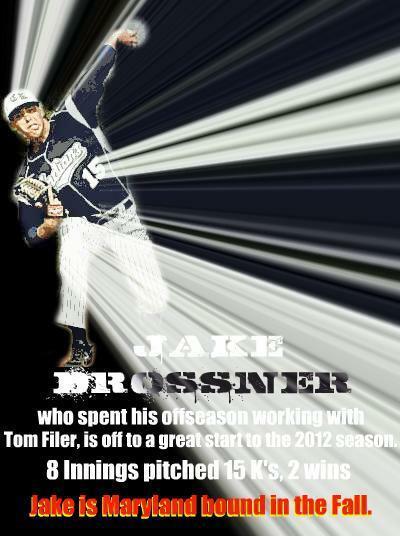 We expect an even better 2013 high school season from him and of course great things at Widener! Congratulations Joe! We're incredibly proud of your achievements! Reasons for choosing Lehigh: “I really liked the whole atmosphere of the campus, and I knew I could get a really good education there for engineering or physics. I loved their baseball coach and their whole program and how they set it up. I really liked how their coach tries to get you in a summer league for more development and to work on your mechanics so you stay in the groove. 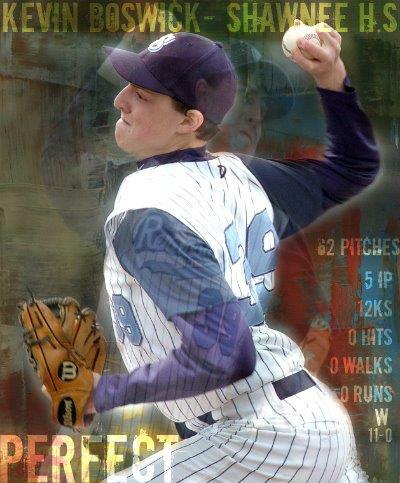 What was the progression that led you to playing collegiate baseball? “From when I was a kid, I always wanted to be a major league player, but I knew I had to get to college first. Probably in middle school or my freshman year, I started to realize I had a chance to play at the collegiate level, and I needed to work hard. 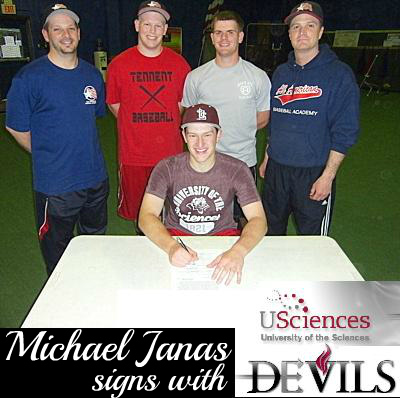 Years of hard work and dedication have paid off for Academy Member Michael Janas who signed a letter of intent to attend University of the Sciences. His decision to play for the Division II Devils was heavily influenced by his desire to pursue a degree in Physical Therapy. U. Sciences was a perfect match. We expect his great work ethic will continue to help him excel on the field and in the classroom. Congratulations Michael, we wish you the best of luck! What was the progression that led you to playing collegiate baseball? “Ever since my freshman year I knew I wanted to, and probably even in middle school I knew I wanted to play baseball as long as I could because it’s my passion and I enjoy playing it a lot. Cody Stoneback chooses Millersville University! What was the recruiting process like for you since you were playing football for a CR South team that advanced to the district title game? “It was a lot tougher because I couldn’t play fall baseball to try and get recruited like all of my friends did. That was a little wrench in there, but I knew it was all going to work out in the end. I knew I would find the right place, and I think West Virginia is. How long have you known that you wanted to play collegiate baseball? “Basically, ever since my seventh grade year – once I moved up to the big field, I realized that I might have an opportunity to play at the next level, and my dream kind of came true. Reasons for choosing Delaware: “When I went to Delaware, I still had other schools to go visit, but after I went to Delaware, it was like ‘This is where I want to be.’ I liked the campus, and it’s really close to home, which I liked. One of the biggest things that made my decision was the coaches. They’re like your parents when you’re away from home – anything they can do to help you. When I stayed with the players – everyone had good things to say about the coaches. What was the progression of the recruiting process for you? “Once I came up as a freshman and made varsity, it made me think that maybe this is what I could be doing in college. As the years went on, I kept improving and getting better. In my sophomore year, I started hearing from coaches, and by my junior year, I really started hearing from a lot of coaches. With college choices at every level, ranging from DI, to DIII, Patrick Carbone has selected Trinity College as his first choice. 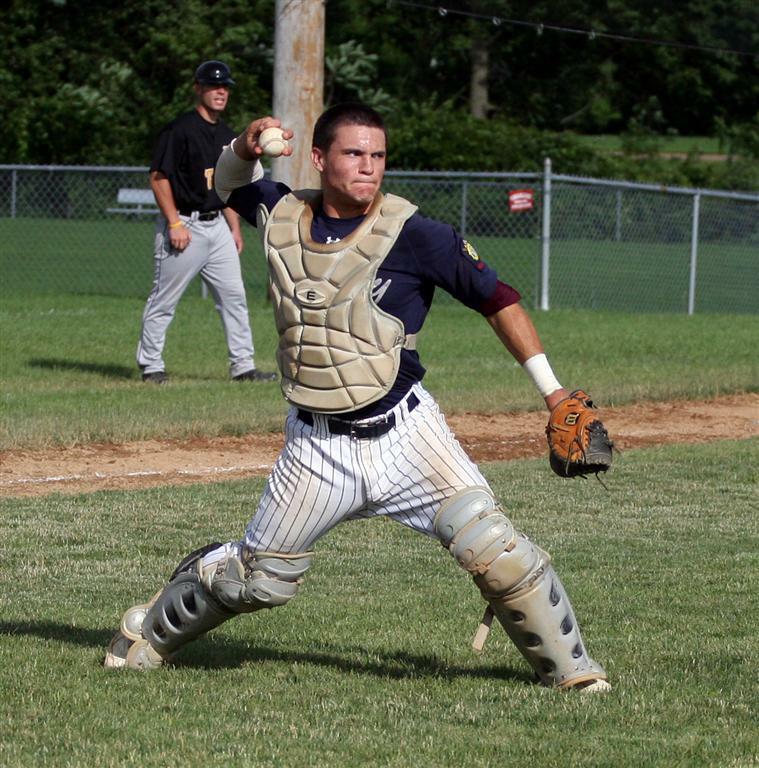 Patrick has had a whirlwind experience since last summer when his hitting, fielding and pitching was a key factor in his American Legion team going to the World Series. Trinity is a perennial contender in the DIII college world series and we hope Patrick will continue his successful path at the college level. Congratulations from all of the Academy members and the Academy staff! Matt Jones, Head Coach for the Nationally ranked Shippensburg Raiders, heard about RJ Grant from an umpire who saw him play in an Academy game last fall. RJ had a pretty good day striking out 12 batters against a very talented PA select Team. Coach Jones traveled across the state to see RJ for himself. After watching him throw at the Academy, it was a done deal. Coach Jones convinced RJ to select Shippensburg, where he will get a great education and join a squad with a national reputation. You never know who is watching you. Congratulation to RJ and his family from the Academy staff and all of our members. The two year journey of college recruiting has been quite a ride for Rico Goldstone and his family. After traveling thousands of miles, attending college camps, clinics and showcases, Rico has decided to attend Navy, his number one choice. Rico was recruited for both baseball and track and field. He becomes the first All American Baseball Academy member to be recruited by one of the service academies and we are very proud of this great accomplishment. Congratulations from our staff and all of the Academy members. Rob McCabe created some very good options before selecting the University of Maryland Baltimore County. Rob will be attending UMBC on a baseball Scholarship in the 2010 fall semester. He was pursued by schools like Shenandoah University in Virginia, Salisbury University in Maryland, as well as Stony Brook in New York. Rob was impressed with the coaches and the athletic facilities at the UMBC campus. U.S. News and World Report, recently selected UMBC as the number 1 "Up and Coming University." Rob appears to have found a great fit. The Academy members and our staff offer our congratulations to Rob and his family. Abington Friends Senior, Nate Simon, had many offers to consider before deciding to attend Gettysburg College. Schools like Suquehanna, McDaniel, Guilford, and Ithaca, all pursued Nate for the last year. One of the hardest working players to come through the Academy program, Nate is a perfectionist with a passion, working constantly on his hitting and fielding skills. In addition to being a great ballplayer, Nate is an excellent student. Gettysburg will be a perfect match for a student athlete like Nate. The Academy members and staff, offer Nate and his family, our congratulations and all the best, this coming season and through what we hope will be a very productive college career.